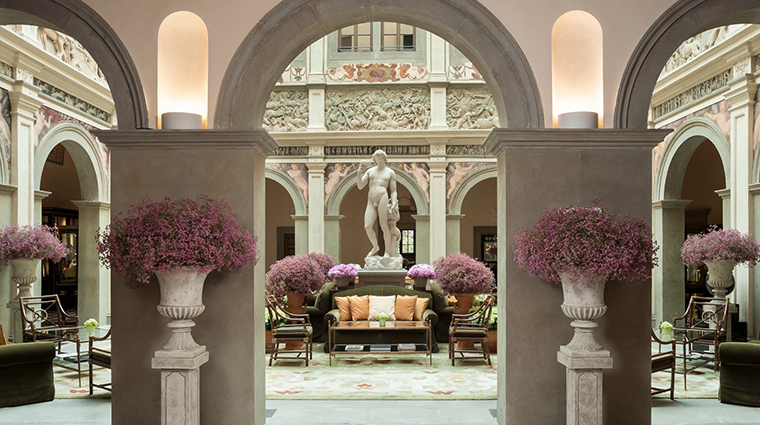 You’d never guess that the unassuming walls of Four Seasons Hotel Firenze, which lies just outside of Florence’s city center, hide a sumptuous Renaissance-era palace. 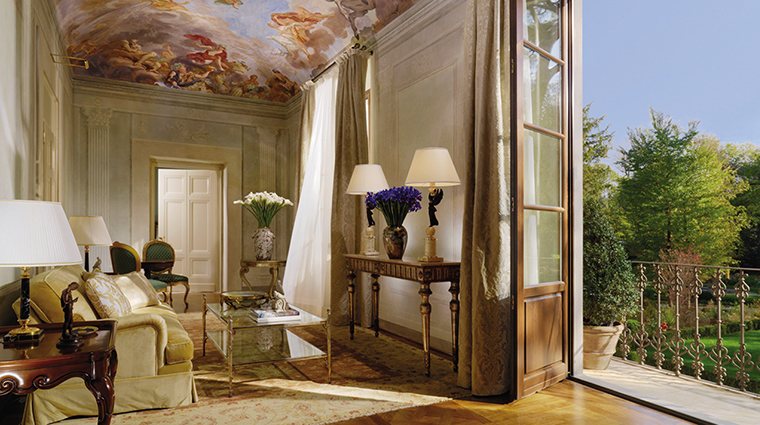 But upon entering hotel, you’ll find a big hint, an enclosed loggia circled with a frieze that dates back to after 1473. Sit on one of the plush sofas to admire the 12 bas-relief sections depicting mythological stories with a statue towering in the middle of the light-filled space. 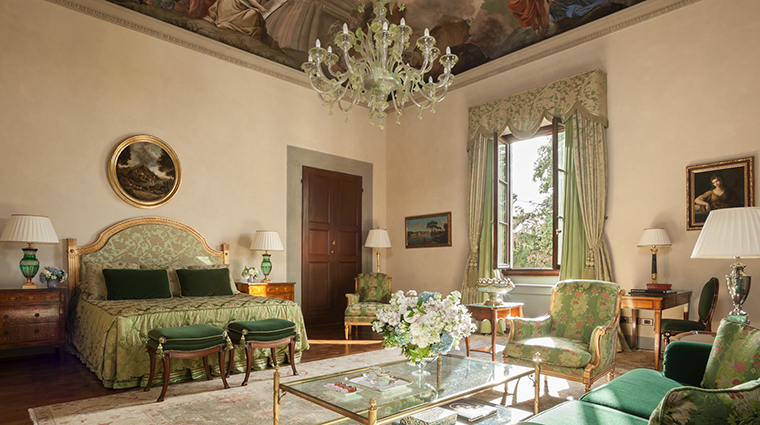 The artistic touches aren’t limited to the palatial loggia — the entire hotel is like a museum with restored frescoes, bas-reliefs, stuccoes and silk wallpaper at every turn. 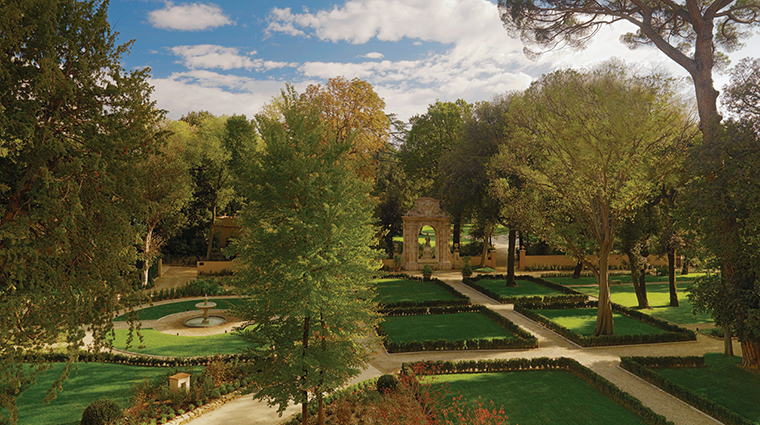 The city’s largest private garden also is nestled within the heart of the property. Walk the paths to see the lush lawns framed by yew, thuja and Mandarin orange trees as well as wildflowers. 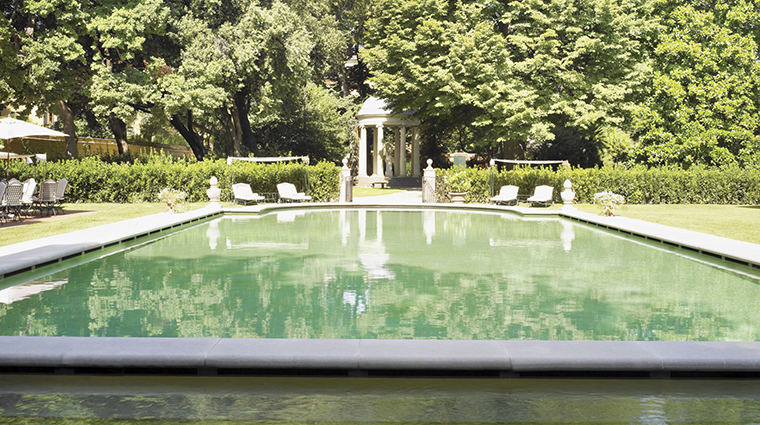 You’ll also discover the 91-foot-long pool, fountains, an Ionic temple, a pavilion and a number of original sculptures, including contemporary artist Ugo Riva’s Il Paradiso Perduto, a bronze and iron work depicting a pair of forlorn angels. 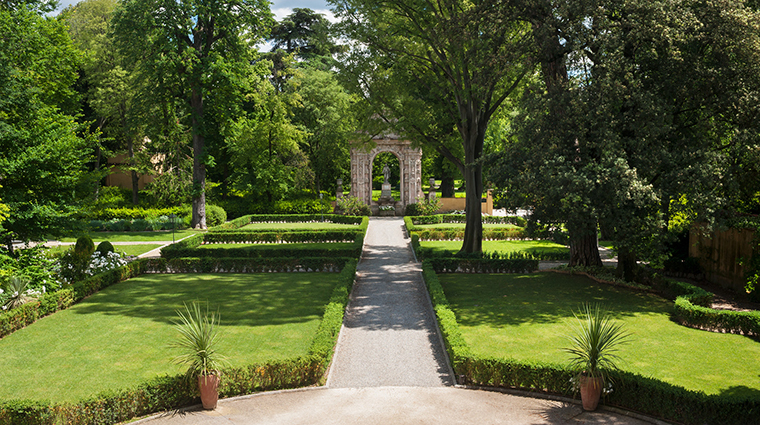 One of our favorite parts of the hotel is its Giardino della Gherardesca, an 11-acre secret garden filled with art that dates back to the 15th century. 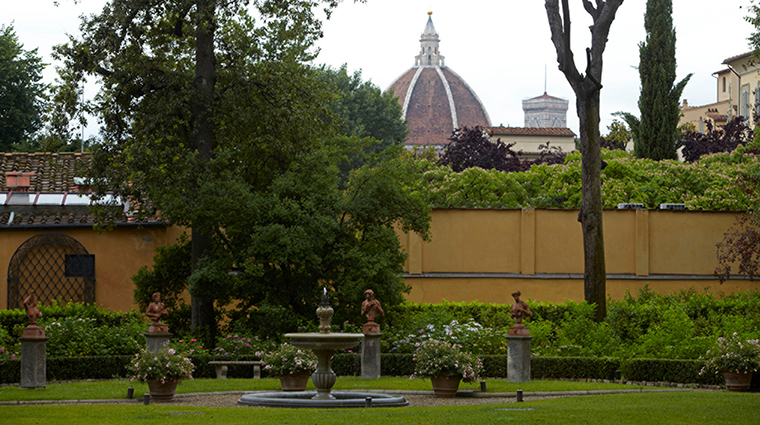 The two-story Spa at Four Seasons Hotel Firenze gives you views of the pool and surrounding park. Reserve treatments like La Vie en Rose, a body scrub applied with silk gloves, followed by a head and upper-body massage with soothing rose oil. The hotel maintains a weekly calendar of kids activities that include cooking classes and making dough sculptures. 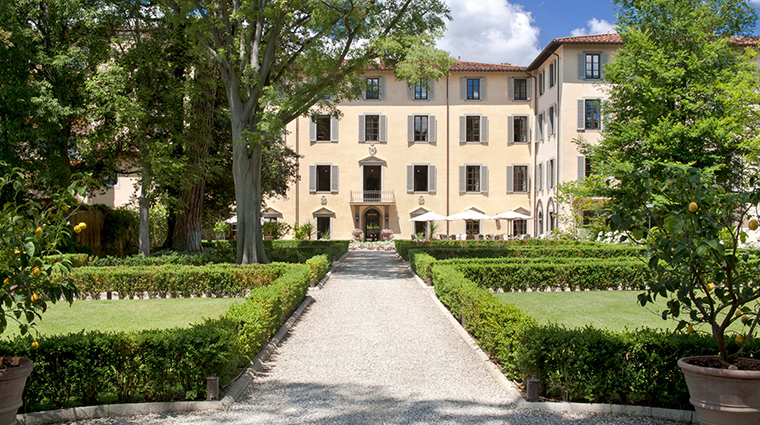 Adults can join a morning run club, yoga and Pilates sessions, a negroni tasting, cocktail-making classes, boating excursions on the Arno, biking in the Chianti region and more. The gorgeous design is impressive, especially in the suites. 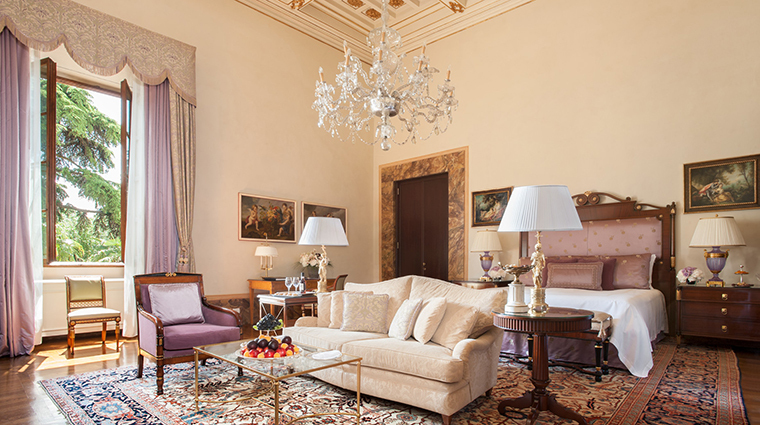 The Sangallo Suite takes on a regal look with deep purples and a white-and-gold coffered ceiling above the bed, while the Scala Suite offers a fresco of angels on its ceiling. 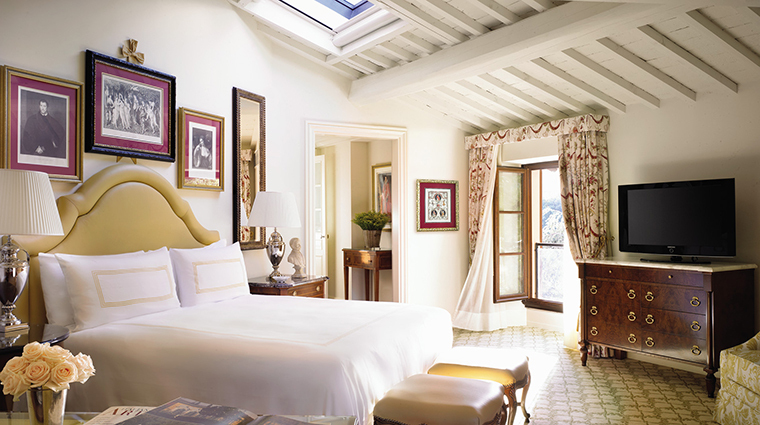 The Royal Suite wows with art on the vaulted ceilings, gorgeous frescoes and stuccos and an 18th-century ceramic floor. Il Palagio is a destination restaurant. 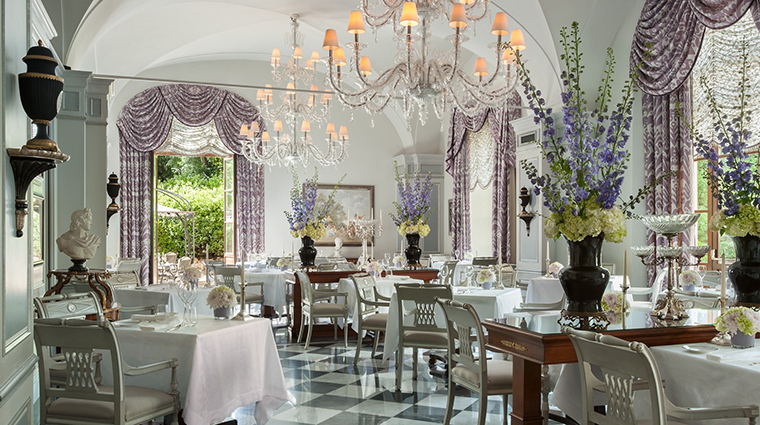 Under the antique vaulted ceiling and elaborate chandeliers with tiny lampshades (or the stars, if you decide to dine on the patio), you’ll be entranced with executive chef Vito Mollica’s modern regional Italian cuisine. 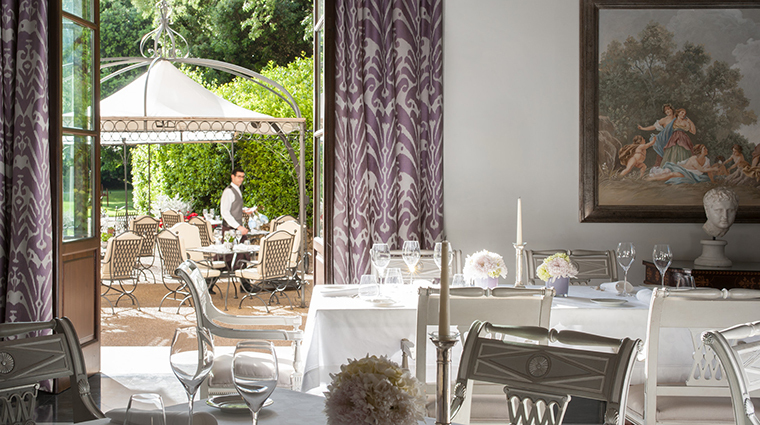 If you want an indulgent only-in-Florence dining experience, the historic hotel can set up a private dinner on the Ponte Vecchio’s only terrace. 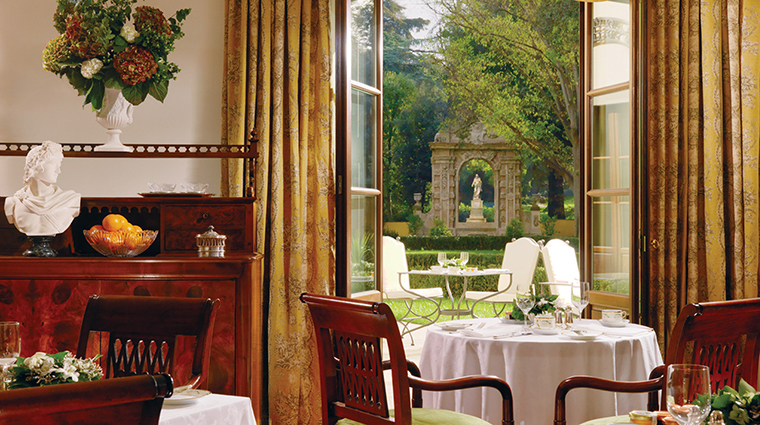 You’ll get great vistas of the Arno River while noshing on a four-course meal made by chef Mollica onsite. 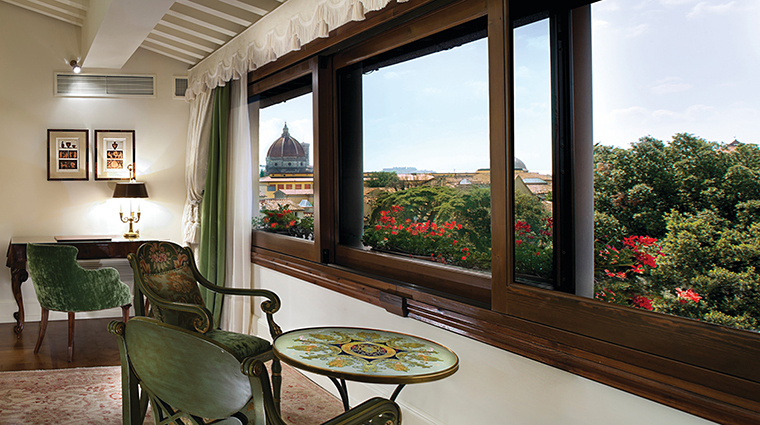 Choose from two buildings at the stunning Florence hotel: the Palazzo della Gherardesca, a converted 15th-century palace, or the Conventino, a former 16th-century convent. 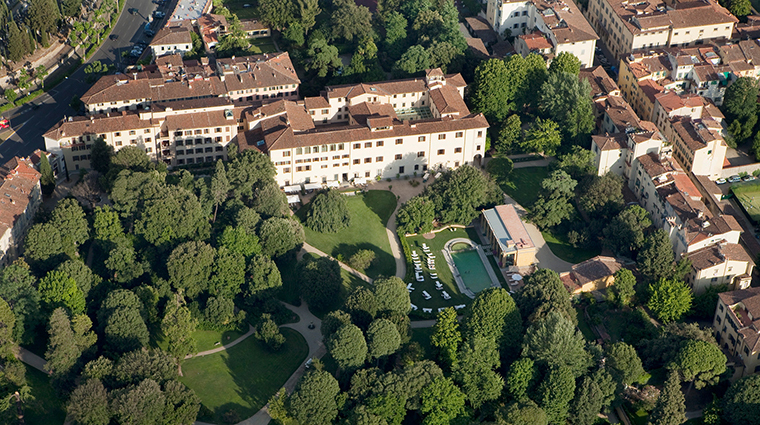 The 37-room Conventino sits at the opposite end of the garden, so it affords more privacy and less foot traffic. It’s like a hotel-within-a-hotel, offering its own reception desk, concierge, breakfast room (La Magnolia is only for Conventino guests), butler service, business center and presidential suite. 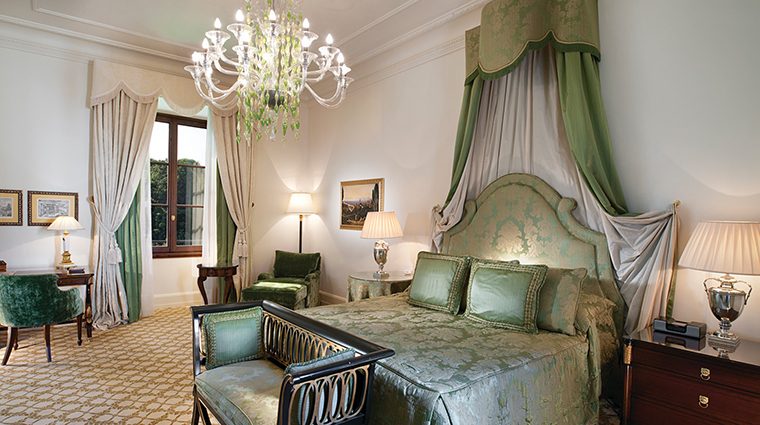 None of the luxury hotel’s 116 rooms are the same; they have different dimensions and original features, such as frescoes, bas-reliefs, skylights, ceiling art, staircases, fireplaces and friezes. Designer Pierre Yves Rochon (who also did the opulent interiors of Four Seasons Hotel George V, Paris and The Savoy in London) decorated each room individually with lavish period furnishings, rich brocades and velvets, but you’ll see green and yellow palettes used in many of the spaces and a white marble bathroom in each. 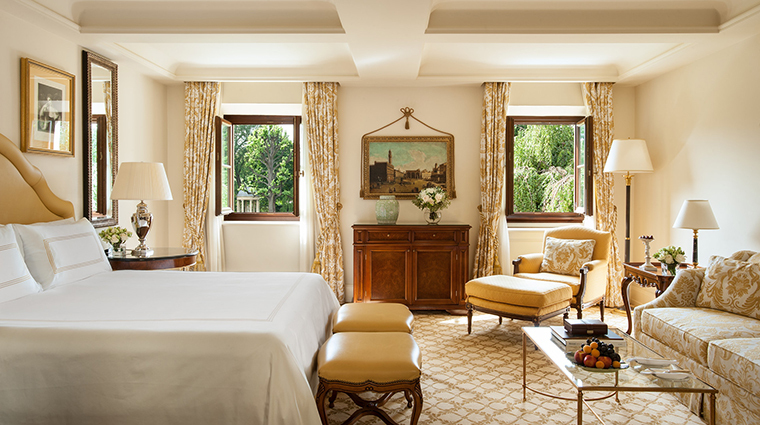 You’ll find even more luxurious touches in the specialty suites. 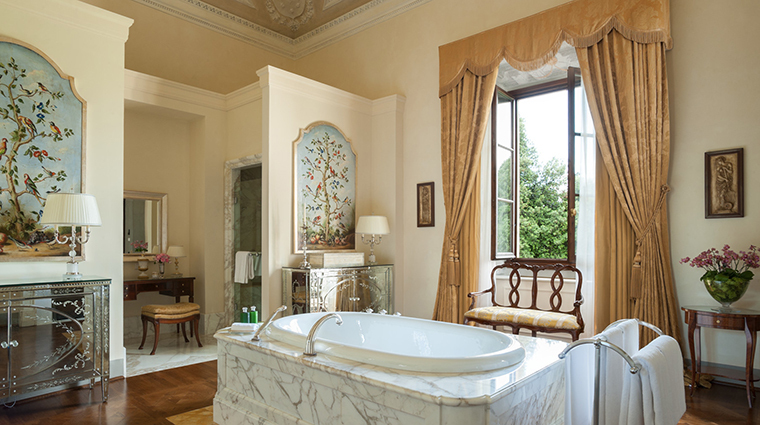 In the Stephenson Suite, a white marble tub sits in the middle of the stuccoed bathroom, which also features carved silver armoires and a fireplace. 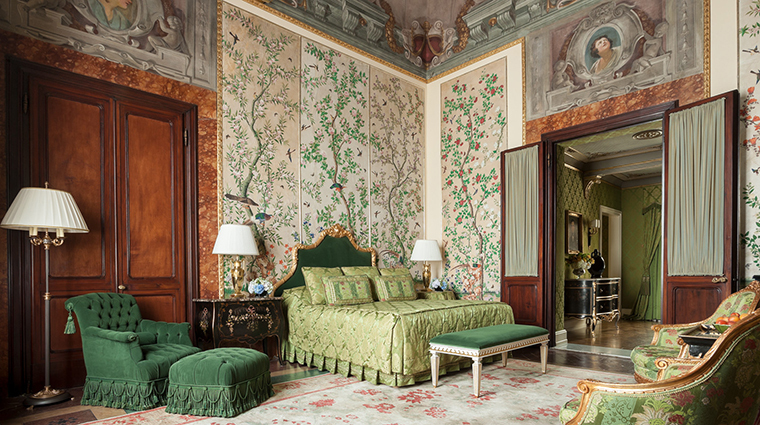 The Volteranno Suite stands out for being draped in Chinese silk wallpaper. At Il Palagio, try cacio e pepe, the Roman version of mac and cheese. Here it’s cavatelli served with marinated red prawns and baby squid. To see what the chef can really do, opt for the five-course tasting menu, which regularly swaps in dishes like a pine-nut-crusted veal filet with black cabbage and creamed celeriac. Don’t skip the desserts, which look like pieces of modern art. Try the frozen mango egg with caramel Chantilly and salted chocolate crumble or the violette bubble, an iridescent violet ball. Pierce the purple shell with your spoon to unleash fragrances of vanilla and cassis along with the cream and sorbet filling. Within Il Palagio is the Winery, a space surrounded by more than 400 bottles of wine. The menu here veers more toward foods that pair well with wine tasting, that is, assaggini, or Italian small plates. For a more relaxed setting, head to the Atrium Bar. The handsome brown and gold bar in the back and the nightly live piano music make it a spot for a light dinner and drinks, like the 100 km Tiramisu Cocktail, a liquid version of the Italian coffee-flavored dessert whose ingredients are all found within 100 kilometers (or 62 miles) of the hotel. 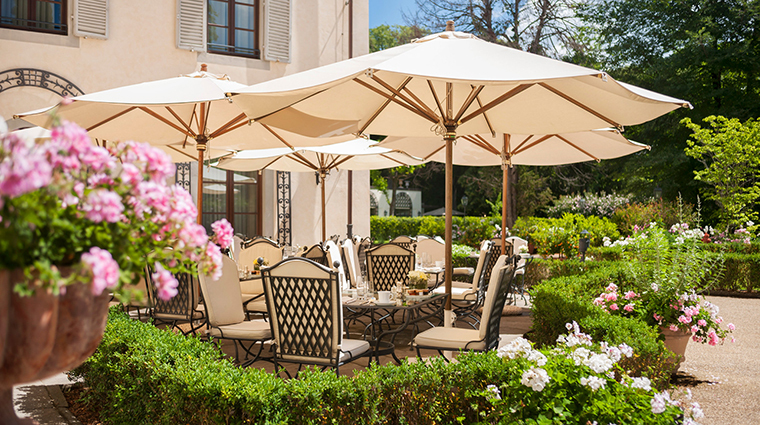 Make the most of the garden by enjoying an meal outdoors overlooking the green space at the casual Al Fresco, which serves a trattoria-style Tuscan menu at lunch and pizza at dinner. Or simply head to the alfresco bar to sip a glass of wine while taking in views of the adjacent pool.